Anchor Hocking Heritage Hill Beverage Dispenser contains a 2-gallon Anchor Glass dispenser with spigot and glass lid. 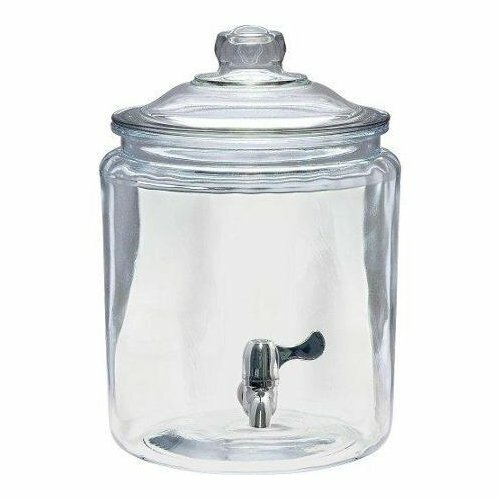 Anchor Glass jars features thick side walls for added durability and stability. Wide mouth opening for ease of access and creation of your favorite beverage; easy to use spigot for quick dispensing; oversized glass knob designed for effortless use. Glass is dishwasher safe; disassemble spigot from glass and wash by hand. America's favorite classic beverage dispenser. The Heritage Hill series by Anchor Hocking is a timeless piece! This dispenser is perfect for registries, new homeowners and holiday gift giving. Anchor Glass is MADE IN THE USA.